Planet Mark’s Summary: America’s Cardroom are the leading site on the Winning Poker Network. This network – which welcome US players from their offshore base – have come from relative obscurity to being the 3rd largest player pool for US players (behind only the Bodog brand site ‘Bovada’ and BetOnline). With the new higher volume of games, there are several extra benefits which are attracting new players every day. These include leader boards, special promotions and rake-races which are specifically designed to keep the bankrolls of higher volume players well topped up. You’ll get a 100% match on your first deposit – and America’s Cardroom (also known as ACR) have a great track record in accepting Visa cards first time. This is a solid site with fast software and I have no hesitation in recommending them to SNG Planet readers – there are a lot of promos including the popular 'Sit N Crush' and 'Beast' progressive leaderboards too. In addition you will now get up to $50 in Tournament Bucks (which allow you to enter tournaments with the equivalent buy-in value) when you make your first deposit. This site is a big success story as we go into 2018, make sure you check them out for yourself! Below is my detailed review of ACR Poker. This solid brand and fast-growing network are really showing the rest of the sites how smooth things can be if you commit to great service and great games. The order is the same as all my other reviews, so you can easily compare the different sites . The navigation bar above can be used to jump directly to any section which particularly interests you. I have to admit being a little skeptical when I first saw the cash game lineup. Rakeback deals, even those handled internally through the site’s own cashier, often lead to large numbers of breakeven nits waiting for others to make mistakes. Instead, the cash games are reasonably loose, with plenty of action – there are several tables in the 40%+ players to the flop even as high as $1 / $2, with many of them in the 60%+ bracket at the micro levels. Blind levels start at 1c / 2c (80c min / $2 max buy-in), the 2c / 5c games seem to be passed over here, with 5c / 10c and 10c / 25c tables having much more action. There is a good choice of tables up to $2 / $4 – though things drop off after that ($5 / $10 games run sometimes, though the $10 / $20, $15 / $30 and $25 / $50 tables are rarely used. You can find cap limit tables as well as the regular no-limit ones and short stack tables with a 50 BB max buy-in run too. Other variations include Fixed Limit and Pot-limit Holdem, Pot-Limit Omaha and Omaha Hi-Lo. Stud games are spread, though the action is minimal. There are rapid changes happening to the tournament schedule on the WPN, and these are definitely positive. With the recent increase in traffic, this network are now able to offer more of everything when it comes to the tourney crowd. More guarantees are appearing in the schedule each week, bigger games are springing up, and there is now an online poker event with a number of high buy-in tournaments ready to roll – and a live event you can satellite into as well. If that was not impressive enough, you’ll find the best Sit and Go promo currently available to US players at America’s Cardroom too. Sit N Crush rewards high volume of play, which keeps these games nice and busy too. I have covered Sit And Goes separately in my unique ACR Poker Sit N Go Review article. Several times a year, you can play in special $1,000,000 guaranteed tournament events, many players win tickets into this game via special qualifiers – though you can also buy-in directly for $640. Last year there were 5 of these in a 6 week period, making it the biggest US tournament event since Black Friday (non-US players are also welcome). There are 10 big guarantees each day, along with a larger number of smaller guarantees and on-demand type tournaments. You can play in rebuy games, knockout bounties and turbo tournaments at America’s Cardroom. The increased guarantees should attract even more players to this network, which can only mean bigger and better tournaments in the future – watch this space for more. You will also find US friendly World Series of Poker qualifiers (and qualifiers to other live events) at ACR. Tables are resizable, and have a running total for ‘the Beast’ jackpot at the top – which at least can help you dream of better things after a beat. At the moment, ACR are not Mac compatible, do not have apps and can’t be played in your browser either. With both Mac and Mobile making up such large portions of the market nowadays, this should only be a matter of time. This site are transitioning from a rakeback-focused cash game model to a more balanced poker site with a little something for players of all the poker variations. I’ll start with the package for new players, which is a 100% match on that first deposit up to $1000 max + free tournament entry token. This clears in $1 chunks, which means no hanging around – you’ll need 27.5 ‘Achievement Points’ per dollar from the tables. Points you earn though the tiered ‘Elite Benefits’ system can be spent on tournament entries and to buy even more bonuses with. 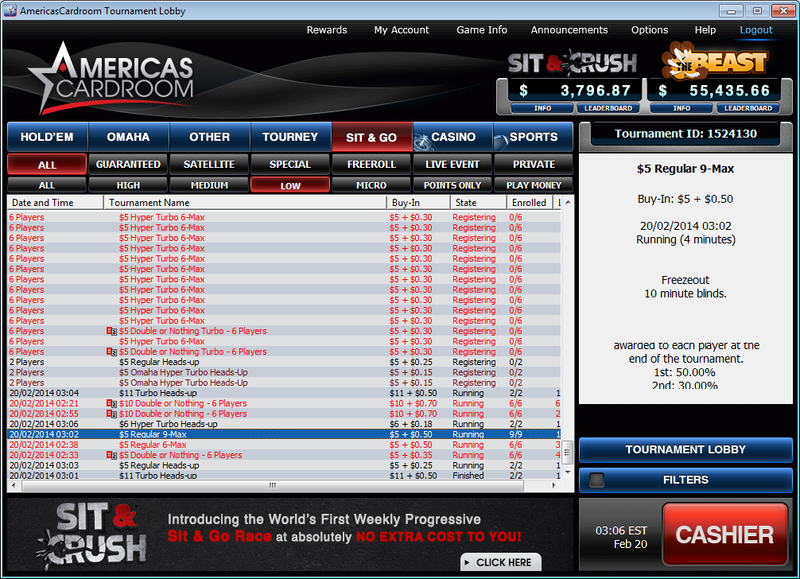 Leaderboard promos and races are common at America’s Cardroom – I am impressed with the ‘Sit N Crush’ system which rewards higher volume Sit N Go players. This is progressive, meaning the more people get involved the bigger the payouts are going to be. You’ll find cash game race promos cropping up too. ACR have a cool cash game leaderboard called ‘The Beast’ which is progressive too. 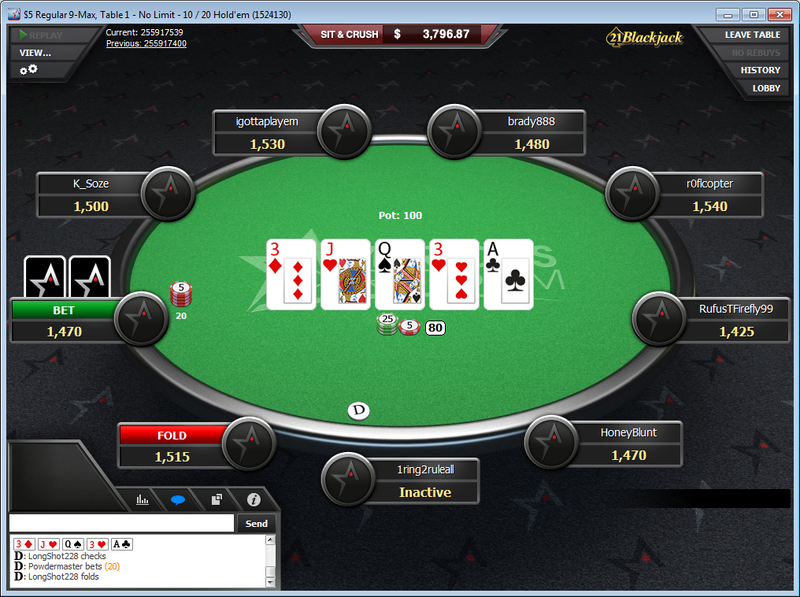 There is also a bad beat jackpot which you can opt in to, you then see 2c per hand taken when you play at Jackpot tables. If you get beaten with quad-9’s or better then you could find yourself with a nice mid-5 figure payout (depends on where the jackpot total gets to). See the ACR website for the details of this and all the other promotions. Tourney fans are coming into the spotlight more recently. You can qualify yourself to the WSOP at ACR poker. There is also the ‘Online Super Series’, which is an online tournament event that comes around every few months featuring some very big prizes – the latest running has $900,000 in guarantees. Finally, do not forget the weekly guaranteed tournament schedule – these pay the advertised prize pool whether enough people to cover it join or not. A US poker success story for 2019 without any doubt. I am looking forward to seeing what this network do with their increased size. There is now some stiff competition, especially from BetOnline and the Chico Network on which their poker room is based.